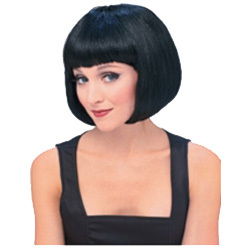 Short black Super Model bob wig. Great Wig at an affordable price. Works well for hundreds of characters. Made from 100% synthetic fiber. Elastic netting inside allows for different head sizes.